I’m a big fan of a good toastie, with warm cheese oozing out of the side, stuffed with all manner of goodness, but sometimes the extra bread and copious amounts of cheese can feel heavy. Here’s a way to fix it. 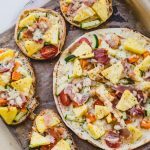 Last year, I was tasked with creating a few new, quick and easy meal ideas for Australian Pineapples – which by the way are in season all year round thanks to our tropical climate in Far North Queensland (the gold variety I used is really sweet and tasty). 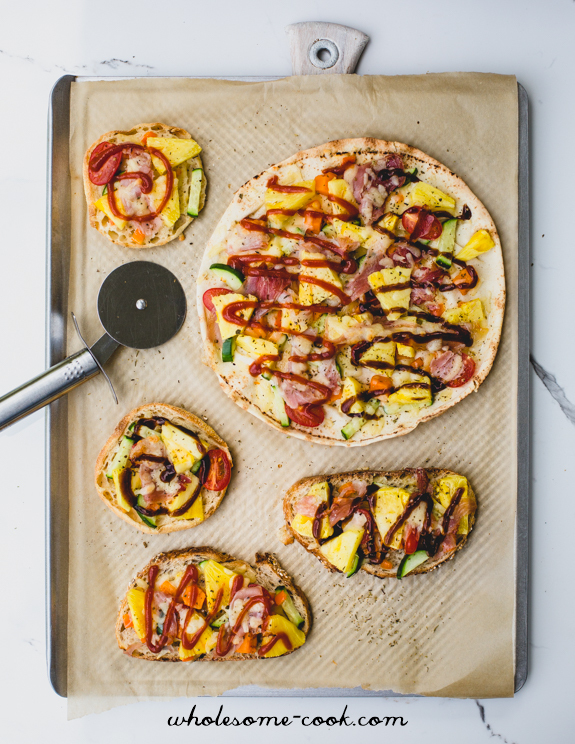 One of the family-friendly recipes was a pizza-style toastie that can be made on a selection of bread, English muffins (perfect for lunch boxes) and Lebanese wraps – I think these will basically become my go-to pizza bases. Here are two simple tricks to turn them into a delightfully light and veggieful mealtimes or snacks. 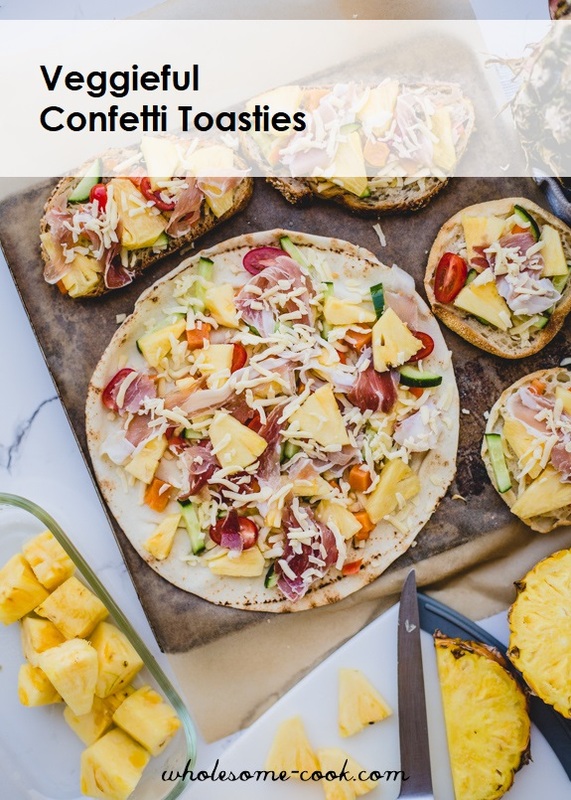 I call them Confetti Toasties, much the same as I refer to this as Confetti Salad. It’s the veggies, cut into tiny pieces that make them look like tiny bobs of confetti. You can use any veggies you like – finely chopped broccoli with garlic butter tastes sensational under a duvet of melted cheese, as do “traditional” pizza toppings. Leftover roasted veg such a pumpkin and sweet potato are also fab! Basically, to make a fun healthier toastie or melt use plenty of veggies per serving. RELATED: How to make a Toastie without a sandwich press. 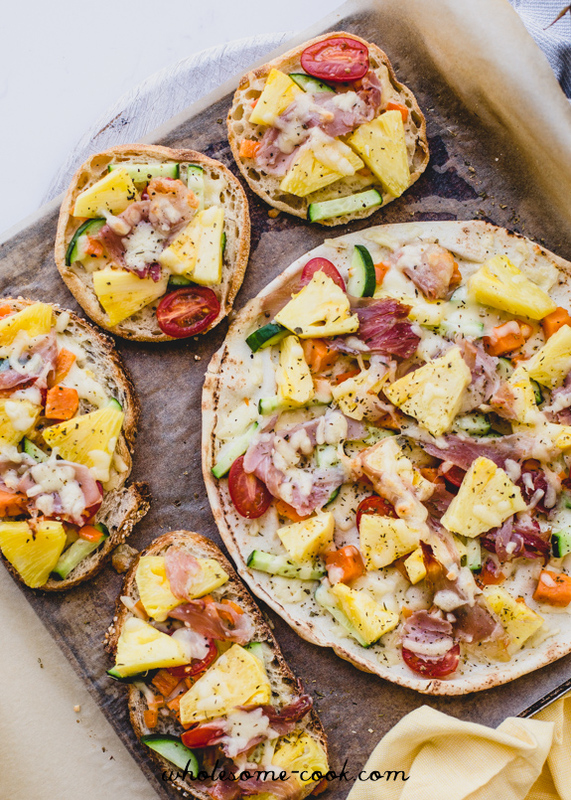 If you would rather enjoy extra veggies and half the bread, then simply do what most Europeans do – place your toppings on top a bread slice, sprinkle with grated cheese and pop that under the oven grill like you would a pizza. You will be able to see all of the fun confetti toppings, too! Use 1/2 to 1 cup of finely chopped veggies per slice of bread, I like sourdough - use whatever bread you prefer. Lebanese flatbread or wraps can also be used with about 1-2 cups of veg to a wrap. As for cheese, cheddar and mozzarella are great, you can add some shredded cheese under the veggies to help them "stick" to the bread as well. Swirl on your favourite sauce and you're ready to serve - or pop cooled toasties in lunchboxes! Preheat oven grill to medium high (160C). Top each bread piece or wrap with quarter of the cheese then layer up with chopped vegetables and prosciutto or ham, if using. Sprinkle each slice with remaining cheese and herbs. Grill for 5-8 minutes or until the cheese has melted. Serve the melts warm drizzled with sauce of your choice.